While I'm a republican, I must confess that I watched last night's nuptials between William and Catherine, the new Duke and Duchess of Cambridge. I had to watch as the event had been so hyped by the corporate media. I wanted to see what the fuss was all about. I also desired to see the Windsor propaganda machine in overdrive. As it turned out the wedding service was completely boring and an anti-climax. Nevertheless, modern royal weddings serve a political purpose in seeking to project the class-based power and influence of the monarchy. I think the idea, pedalled by constitutional scholars and others, that the monarchy is apolitical is utter crap. Betty Windsor still wields political influence behind the scenes through the informal ability to counsel both her British and Commonwealth prime ministers on political matters. These discussions go on behind doors, of course, but that makes them fundamentally undemocratic as how can we truly assess as to whether or not these conversations are truly apolitical? Besides, royal weddings and funerals are great public relations exercises for British Royal Family Inc. 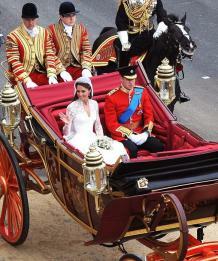 They seek to propagate the idea that the royals are human beings too. The historical reality is, though, that the British monarchy was designed to be a deified institution with its members venerated as being above everyone else. In fact, monarchies everywhere have traditionally derived their authority from religious teachings that rulers must be regarded as divine beings. These teachings are common to most of the world's major religions, including Christianity. While the 'Divine Right of Kings' to rule unchecked has been diluted since the emergence of liberal democracy in the eighteenth century, the British monarchy still retains vestiges of feudalism. These can be found, for example, in Prince Charles's ownership of most of the land in his Duchy of Cornwall. Also, the Sovereign retains the legal right to appoint and dismiss governments without any recourse to Parliament. Although this ability of monarchs to use what is known as their reserve powers has not been exercised by any British sovereign in modern times, the ability to do so remains. There was one indirect exception in Australia where the authority of the Queen was practically invoked by former governor general Sir John Kerr in his dismissal of Gough Whitlam's Labor Government in 1975. Therefore, we cannot escape the fact that the monarchy is an important political institution. And like any political institution, it needs to maintain its power. The best way to project the monarchy's influence in the modern world is through via endless public relations campaigns. Thus, William and Kate's wedding represented another golden media opportunity for the monarchy to keep spreading its spurious, self-justifying propaganda. After all, the media just loves a good romantic tale. A handsome good looking prince falls in love with a beautiful commoner. Handsome prince then dates beautiful commoner for ten years. Said prince then proposes to commoner after nine years. Some months later they marry in a lavish ceremony carried by a swooning international media. But what if it all goes wrong for Wills and Kate? They have seperated before and if things get tough, they could do so again. Obviously, the odds of the newly married couple continuing in wedlock are already said to be good. However, the same thing was also said about the marital prospects of William's parents thirty years ago. Furthermore, the public and media backlash following Charles and Di's very public marital breakdown shook the monarchy to its foundations. If anything, the monarchy is in dangerous territory if, like Diana, Kate's popularity takes off as I think it will. Thus, if something happened to Kate, the monarchy's popularity could nose dive as it did after Diana's death in 1997. In the meantime, fellow republicans shouldn't wait on anything to happen to Kate or William or any other royal for that matter, to strengthen the case for change. Obviously, Kate's popularity will not diminish any time soon. The best thing that republicans can do, in the interim, is to follow the New Zealand Republican Movement's call for the Governor General to be elected. In Britain, progressive politicians should start pushing for a Swedish style monarchy where the monarch is formally, legally stripped of all her remaining political powers with these being vested once and for all in a reformed Parliament. Moreover, any royal should be stripped by the State of land that they have not purchased with their own money, including inherited Duchies. This would mean that Elizabeth II and her successors would truly become ceremonial office holders with only the monarch, heir to the throne and their spouses being paid a regular salary by Parliament (no more than the prime minister's) to perform a limited, defined set of duties. The rest of the Royal Family, who are the world's only true welfare bludgers, would be forced to live off the income derived from their real jobs. But as a democratic socialist, of course, I would not begrudge them the right to utilise the same public health, education and pension entitlements as their fellow citizens. Gradual change is what is needed if we are to move towards becoming a republic. I believe this move will not happen in the forseeable future but at some point, particularly if Wills and Kate part company, then questions will start being raised again about the monarchy's future. And all republicans, by pressing for some of the abovementioned changes, will be ready to press for the next, inevitable leap to be made if and when that happens.